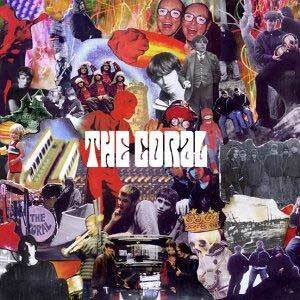 The divide between the two great Northern Cities has never been more apparent than when listening to the debut album by the Coral. Whereas Manchester prefers the gritty realism of The Smiths or Joy Division, Liverpool has always had that psychedelic mysticism about it through from George Harrison to more recently with the Scouse philosophy of Cast's John Power. On the other hand you could just say that the Coral are atypical of their generation and live under a haze of spliff induced smoke while raiding their parents record collection. At the end of the day what the Coral ultimately sell is pop music, albeit very strange pop music, but pop music all the same. Even on the album's least cohesive track "Spanish Main" which sends guitar riffs into outer space still has that all important hook amongst the finely controlled chaos. It's creating that perfection out of chaos which sticks out in these bland times, sounding as if it could have been made any time in the past 40 years it shows just how far Ian Broudie must have been removed on production duties. Single "Skeleton Key" drops the bling bling mobile phone culture of UK Garage and instead picks up one of the cult figures of 5 years previous - the Nintendo Game Boy. With a tune taken from the classic video game Tetris it recalls the days skiving off school, smoking a naughty cigarette with a bottle of 20/20 and trying to convince your parents you'd sat through an afternoon of double geography before watching the bedroom walls spin at 60 mph. Influences reaching far and wide from "Wild Fire" which sees the ghost of 80s TV Theme Tunes mixed with a mellow Led Zeppelin riff through to "Dreaming Of You" which makes you want to shout if it wasn't for those pesky kids ala Scooby Doo. "Simon Diamond" takes in Pink Floyd while "Goodbye" is infused with the spirit of Jim Morrisson. The albums closer "Calendars And Clocks" recalls Mediaeval gregorian chants mixed with Lee Scratch Perry. An album which defies categorization and still has the ability to reach out of the ghettoized leftfield indie leanings of bands like the Beta Band. While their success is assured in England and to a certain degree the former Soviet Union - the true test will be whether the Americans can accept these strange English eccentrics.